Providing diverse, technologically progressive and cost effective services that are responsive to our client's regulatory and business needs. Maintaining a standard of high quality in the services we provide. Emphasizing a team oriented approach to all projects. Maintaining the skills, education, and qualifications necessary to provide the best in professional scientific and technological services. Every employee is charged with the responsibility of conducting each task in a manner that will achieve these stated objectives. Empire will not compromise the quality of the work or the integrity of our services in an attempt to satisfy short-term goals. Our long-term goals will be satisfied through the quality of our work. We recognize that our success as an enterprise depends on the talent, skills, and expertise of our people and our ability to function as a tightly integrated team. We appreciate our diversity and believe that respect - for our colleagues, customers, partners, and all those with whom we interact - is an essential element of all positive and productive business relationships. We understand the importance of our missions and the trust our customers place in us. With this in mind, we strive to excel in every aspect of our business and approach every challenge with a determination to succeed. 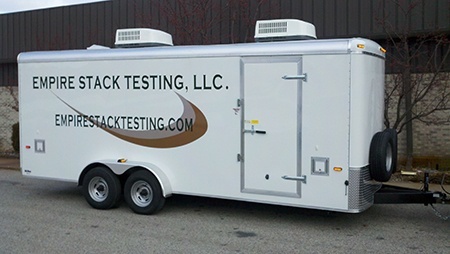 Empire Stack Testing, LLC services the entire Northeast from their Buffalo, New York facility. Some of the states serviced include New York, New Jersey, Pennsylvania, Connecticut, New Hampshire, Vermont, Massachusetts, Michigan, Ohio, West Virginia, North Carolina, South Carolina, Florida, and Georgia. The information contained in this website is for general information purposes only and is not a representation or warranty of any kind, express or implied, about the completeness, accuracy, reliability, suitability or availability with respect to the information, products, services, or related graphics contained on the website for any purpose. The contract, including the terms and conditions, to be prepared for each engagement will exclusively determine the services to be performed, the fees to be charged, any warranties to be provided and the liabilities of the parties. Through this website you are able to link to other websites which are not under the control of Empire Stack Testing, LLC. We have no control over the nature, content and availability of those sites and assume no responsibility for their use.